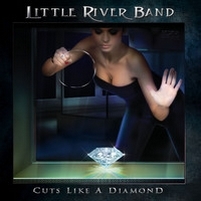 I do remember Little River Band from their hit The Night Owls, but can't say I have been following them and so I didn't realized that they are still alive, but without any original member. Now their 18th studio album is out, Cuts Like A Diamond it's called. The band was founded in 1975, so it's no surprise that they have been through line-up changes. And as they were active all these years they have released quite a few albums. They are still play melodic rock and bassist Wayne Nelson's voice fits well to their sound. They kick off with The Lost And The Lonely... Check it out! The tune Forever You Forever Me is catchy and with former LRB vocalist John Farnham it might have been more powerful, but Nelson is doing very well! The title track comes next and it's a radio-friendly tune with a catchy melody... Something you'll soon sing along. One of my favorites is Way Too Good, not too different from the other tunes of Cuts Like A Diamond. The highlight is Who Speaks To Me, this one has the potential to make it on rock radio... Wish they would do a video for this one! A good piece of work which make me check out some older stuff of the Australians!